tr. from Norwegian by Tara Chace. illus. by Svein Nyhus. 48p. NorthSouth. Mar. 2019. Tr $17.95. ISBN 9780735843400. 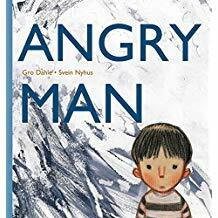 Gr 1–4—Sometimes Boj's daddy is calm and cheerful, but other times Angryman comes out of the dark cellar within. Boj can hear him coming, even as he silently promises to be good, be quiet. Angryman possesses Daddy's body. As Boj trembles in Mama's arms, he "doesn't want to hear. He doesn't want to see. He doesn't want to remember." Mama's attempts to physically shield Boj fail as Angryman approaches, burning "red and red and red and black." Finally, Angryman recedes and Daddy cries, promising to be nice, as he has promised many times before. Eventually, Boj summons the courage to write a letter to the king, who absolves Boj of all blame. The king takes Daddy to live with him in a place where he can learn to manage everything and everyone trapped inside. Boj looks forward to visiting his daddy one day. He can't wait to visit a daddy he can trust to keep him safe. Translated from Norwegian, the text and illustrations depict Boj's fear and anger with naked honesty. At once straightforward and yet lyrical, the third-person narrative is childlike and oftentimes heartbreaking. The dedication gives thanks to a family therapist and a psychologist both consulted in the creation of this title. The mixed-media illustrations employ thick, broad charcoal or oil pastel lines, fabric and paper textures, and a muted palette. As Boj's perspective changes, so do his mother's and father's size, shape, and expressions. Only the promise of a rosy ending seems strange and perhaps unrealistic for many children with abusive caregivers. While this tender and sensitive look at domestic violence is meant to be read and discussed with a trusted adult, it offers no back matter or resources to provide context or support for kids in abusive situations. VERDICT This child-centric look at a tough topic that will be a useful tool for counselors and therapists looking to start conversations.